From the Star Wars The Force Awakens collection by Silver Buffalo. Star Wars Episode VII The Force Awakens Kylo Ren Rule the Galaxy 18 Ounce Oval Ceramic Mug. This Item is in stock and ready to ship. 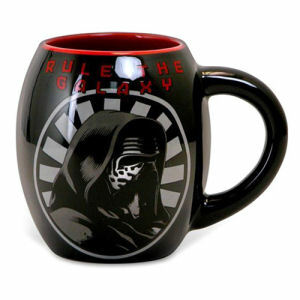 You should not postpone your purchase and miss out on adding Star Wars Episode VII The Force Awakens Kylo Ren Rule the Galaxy 18 Ounce Oval Ceramic Mug to your Star Wars The Force Awakens collection! From the Star Wars The Force Awakens collection by Silver Buffalo. Star Wars Episode VII The Force Awakens Kylo Ren Rule the Galaxy 18 Ounce Oval Ceramic Mug. Mug holds 18 ounces of liquid. Hand wash only. Not dishwasher safe. Do not microwave. Measures 4.75 inches tall.